Content comes in all shapes and sizes. Helpful how-tos, webinars, whitepapers, roundups and rants. But there is one type of content that crushes almost anything else you can publish. But most companies never do it. Yes, it’s work to create a research report, but it’s not as hard as you might think. 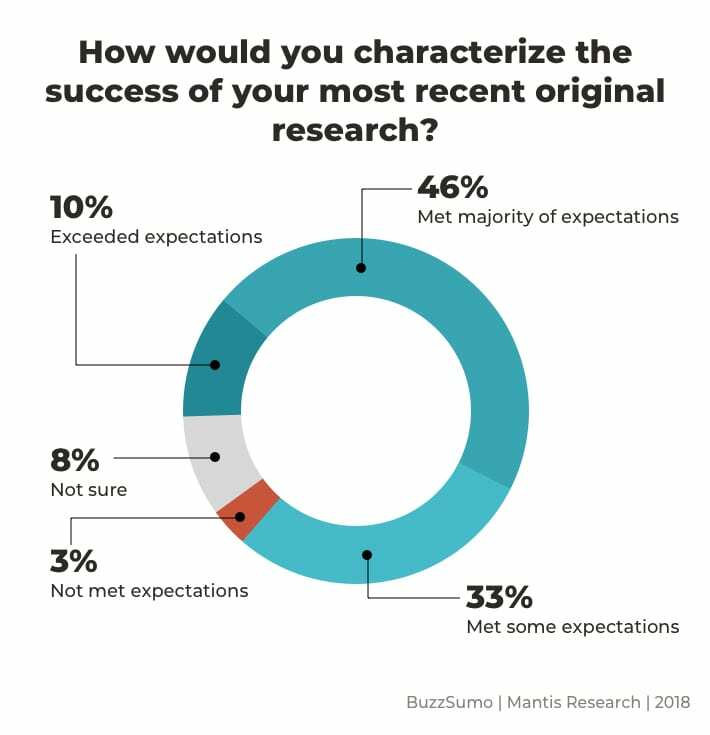 Let’s look at why research is so successful and some examples of how it fits into a content marketing mix. 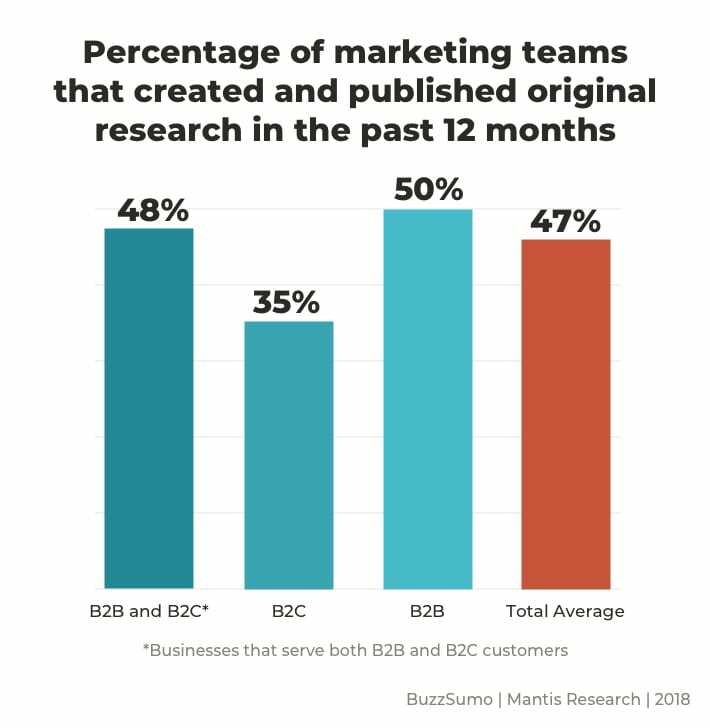 This is according to a new study by Buzzsumo and Mantis Research. I’m not surprised. 56% of respondents report that their results met or exceeded their expectations. Only 3% were disappointed. I don’t know of any other format for content with these kinds of results. So why does it work so well? Advice, tips, news, trends, how-tos – they’ve all been done before. But original research is new. So it solves a problem for marketers who struggle to stand out: originality and differentiation. 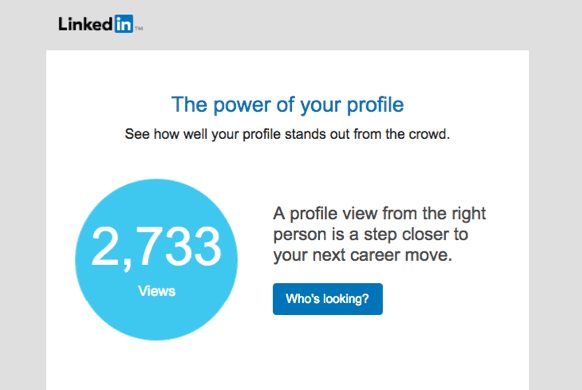 The LinkedIn Marketing Solutions team found that status updates that include statistics along with a link to content get 162% more impressions and a 37% higher click through rate. Qualitative data is one of the two types of evidence you can add to your sales pages. The data can make your case and can improve conversion rates. Anytime you launch an outreach campaign, you increase awareness for your brand and yourself. You are giving yourself a reason to talk to important connections or email a ton of contacts. When Steve Rayson of Buzzsumo analyzed 1 million articles, he found that most content doesn’t get traction in search or social. 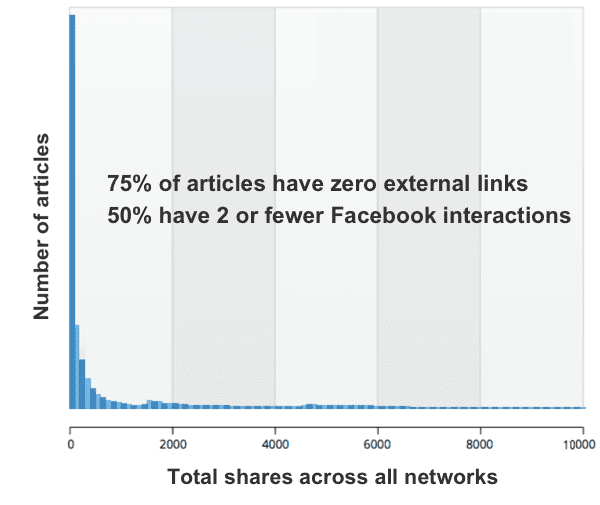 75% of the articles had never been linked to, and 50% had fewer than two Facebook Interactions. That’s not good. Creating opinion-forming journalism on a regular basis is not a scalable option for most of us, so we’re left with research as the format that consistently outperforms all others. So you’d think that it would be popular, right? Only 47% do it. I’m actually surprised that number wasn’t lower. But not surprising, it’s a more popular strategy for B2B businesses. B2B businesses often need middle-of-funnel content and therefore go deeper into big topics. So it works, but most companies don’t do it. Why not? Probably, it’s a question of knowledge, time and initiative. So let’s break it down. What kind of research should we create? How can we get started? The rest of this post is a short guide to producing high-impact original research. Original research as a format for content marketing is so effective, it’s crazy more brands don’t do it. 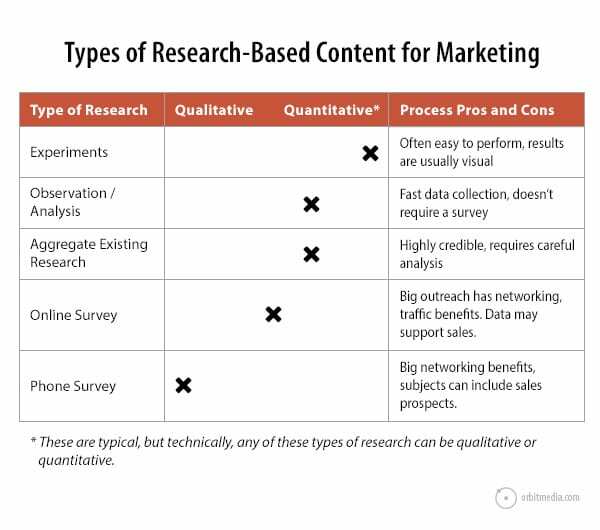 Here are five types of research you can add to your content mix. Each has its own benefits and outcomes. A client once asked me if a search box is standard on websites. I was tempted to give a quick answer: it depends. But instead, we decided to do a little research and find out. First, we needed a set of sites to check. So we went to Alexa and grabbed a list of the top 50 marketing websites. Alexa is great for this because they have a list of the top websites in every category. Step two was to find a freelancer to review the sites to see which had search tools. We added nine other questions while we were at it. Step three, turn the data into visual charts (10 pie charts and a roundup bar chart, see below). 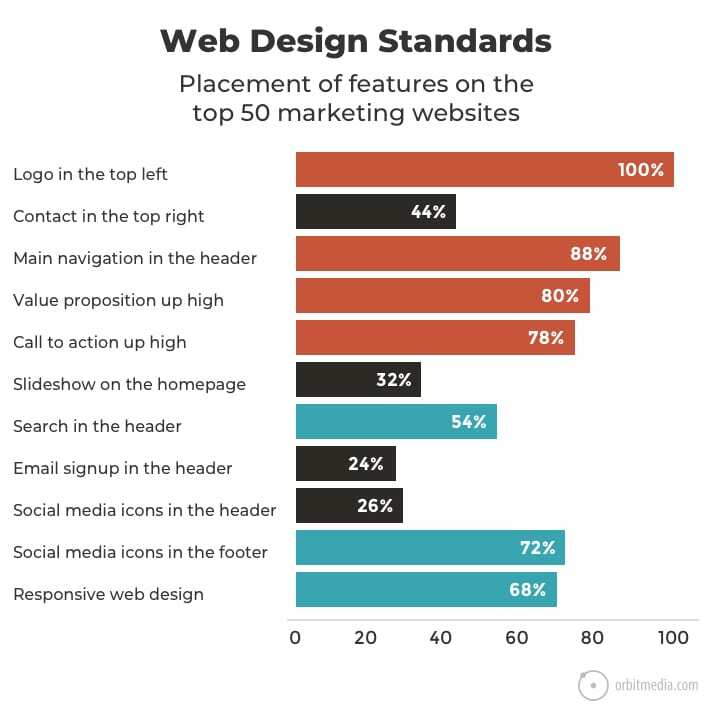 Step four, write the article: Web Design Standards: 10 Best Practices on the Top 50 Websites. The post was a hit, earning 178 links and 610 shares. Also, the post is search optimized and ranks for the phrase “web design standards” so it attracts a few hundred visits per day and has been visited more than 100,000 times since it launched. You tried something. Did it work or not? Anything that you or your company tried is potentially publishable research, as long as it produced a data point. There’s an audience out there that wants to see your findings. It’s a case study with a different angle. The key is to publish a conclusion that is relevant to a broader audience. It’s not about you. It’s about the truth. 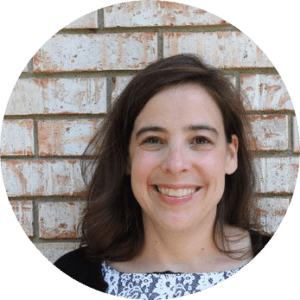 Joanna Wiebe and her team at Copy Hackers have a data-driven approach to helping clients. They run tests to measure the results of their work. Sometimes, they publish the results of those tests. Joanna’s case study about the Mad Mimi Pricing Page is a great example. The experiments they ran resulted in a 500% lift in conversions. It also produced a beautiful, visual piece of content. This experiment and its results have appeared in many marketing presentations. It’s also earned 21 links and 107 shares. Again, the data is already out there. You just need to combine and analyze. When you repackage existing research and data, you may find new metrics that are more credible and useful than the originals. 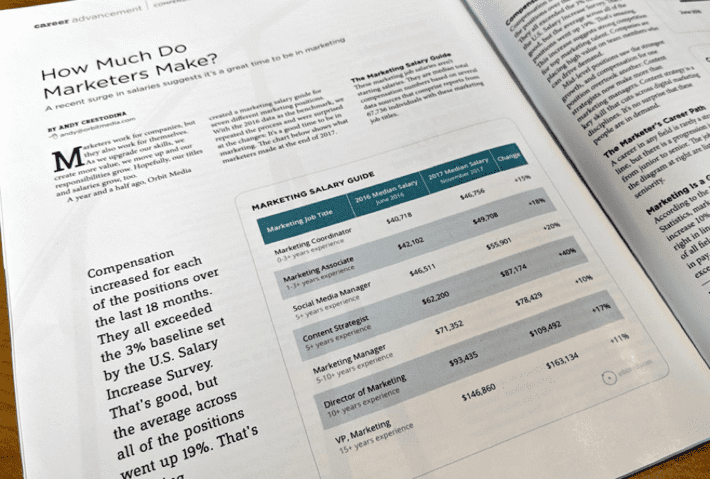 Example: How much money do marketers make? Yes, it’s a question that all marketers find interesting. No, the topic doesn’t really align with our content mission statement (“…practical advice about content marketing, web design and analytics…”) But we knew it would be a hit and we knew it would be easy to create. I don’t have much salary or compensation data myself, but I know where to find it. Glassdoor and Payscale.com have huge datasets. So we simply entered each marketing job title into those sites, calculated the medians and published, with proper citations of the data sources of course. The original piece was a hit. But the best results were yet to come. 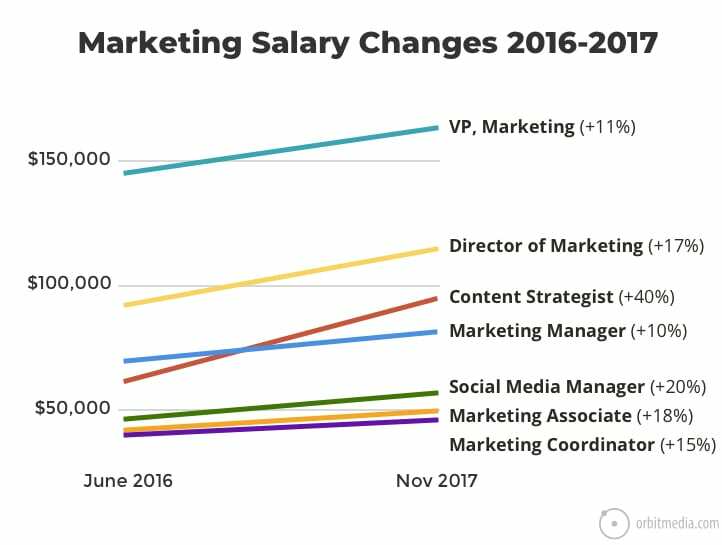 When we updated the research 18 months later, with the 2017 Marketing Salaries Survey, we were able to show how marketers’ compensation had changed. The longitudinal data is even more valuable since it’s not tracked on either of the two original sources. And the insights are amazing. The updated piece has attracted links from 90 websites and has been shared 350+ times. It also gets huge open and click through rates when we send it as a newsletter. It also got picked up by the print edition of the American Marketing Association’s Marketing News. It fit nicely into their career issue. This is the classic approach. Get a large group of people to answer a few questions in an online survey. Analyze the data. Publish. When people take the survey, they can enter their address to get the results. You are building a list as you are gathering the data. Once you publish the results, email the respondents. Any project that involves a lot of outreach will cause a spike in attention to you and your brand. Note: Since this was one, multiple choice question, it’s really a poll, not a survey. Years ago, we set out to find out how long it takes to write a blog post. Through outreach and an online survey, we asked 1000 bloggers to answer eleven questions. The piece was a hit, so we repeated it the next year …and the next …and now we do it every year. The latest Blogger Survey had 1300 respondents (were you one of them?) 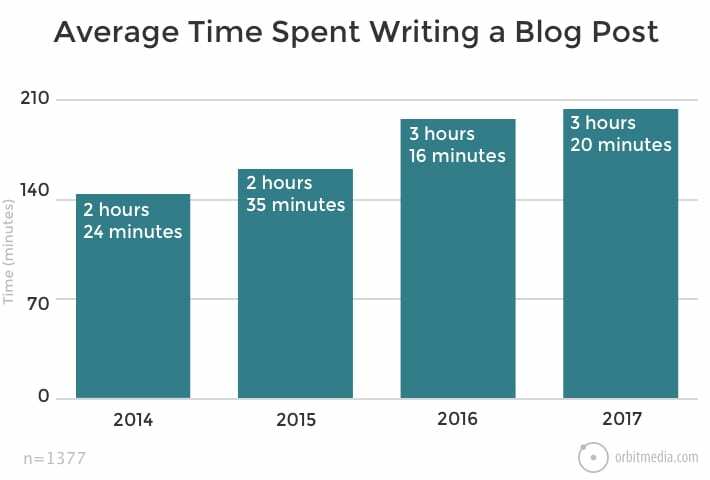 and showed how long it takes to write a post and how blogging has changed over time. You can see the value of repeating your research over time. The value of the data is far greater in subsequent years. It’s been a hit, year after year. Combined, the surveys have been linked to by 1600+ websites and shared 4000+ times. ProTip: To create data that is statistically significant, put the sample size and total populations into a statistical significance calculator, to measure the margin of error. Online surveys are about quantity; phone surveys are about quality. You gather less data but in a more direct way. The secondary benefit is obvious: relationships and networking. 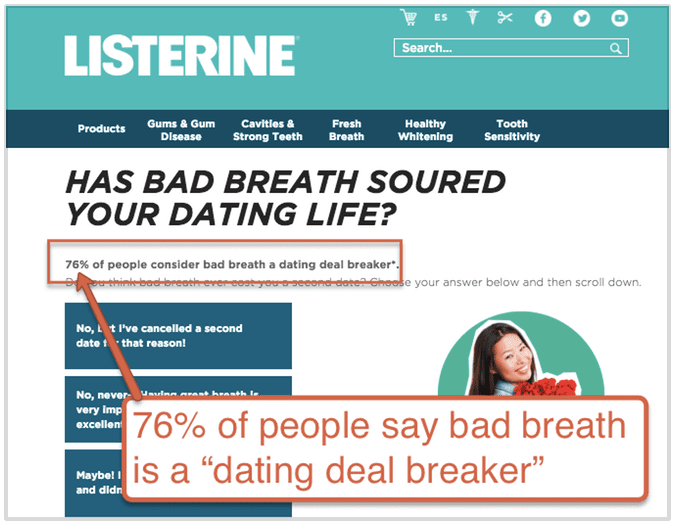 This research gives you an excuse to reach out to high-value connections, like sales prospects and influencers. Build a list, pick up the phone and dial. The call is a very brief interview that starts with you asking questions about the industry. It ends with an offer to share the research once complete. Here are examples of how phone surveys, subjects and content outcomes. Do you sell social media services? Call 50 Marketing Directors and ask about their biggest social challenges. Possible content: 68% of Marketing Directors have trouble measuring social media ROI. Do you sell supply chain software? Call 50 logistics professionals and ask them what tools they use. Possible content: Only 16% of logistics companies have a transportation management system in place. Do you do technology staffing? Call 50 IT directors and ask them about skills gap on their teams. Possible content: 4 out of 5 tech hiring managers are looking for QA/testing experience. Getting a few more ideas? This is actually an Account Based Marketing (ABM) tactic and a powerful way for B2B marketers to get right in front of decision makers. The key to success is to be very considerate and follow up. What are the most important skills for succeeding at C-level jobs? It’s a subjective question. 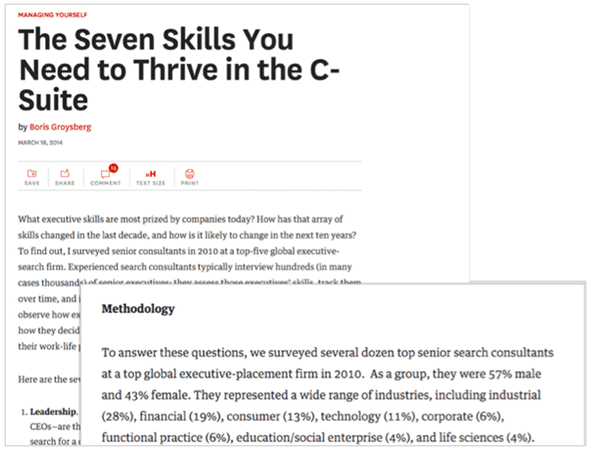 But Boris Groyberg produced a high quality, research-based article on the topic by surveying “several dozen top senior search consultants.” It was published in the Harvard Business Review. This page won 35 links and 351 shares. The networking benefits were probably priceless. If you can find this gap in your industry and produce the research that fills it, you’ll have something truly share-worthy, link-worthy and even press worthy. Seriously, you may want to reach out to the media. You’ve made news. If research is so powerful, why doesn’t everyone do it? Because it’s hard work! It requires forethought and planning, persistence and courage. It’s very time-consuming. The annual blogger survey takes 150+ hours to create. It may take 10x the effort to create, but you’ll likely see 100x the results of a typical article. 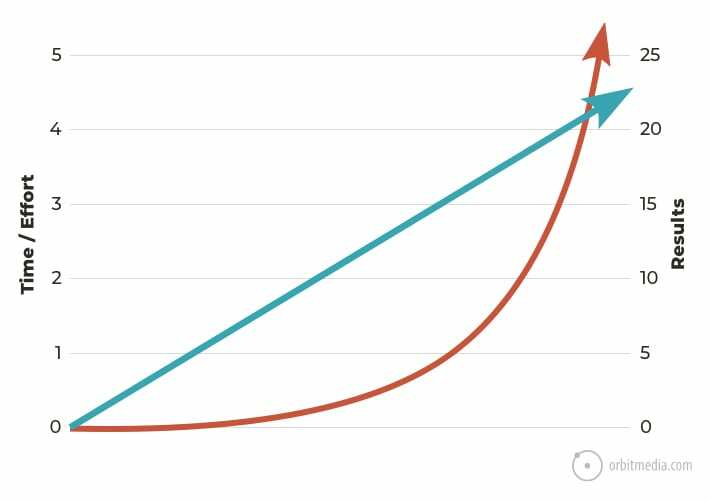 Here’s a very unscientific chart based on our experience that shows the relationship between effort and outcome, costs and benefits, returns and investments. The world is not waiting for another medium-quality blog post. Publish something truly original. Make a contribution to your field. Find the truth and share it with the world. Note: This article is part one in a two-part series about original research in content marketing. Next read: 29 Ways to Promote Your Original Research. Or take a look at Michele Linn’s recent piece, How to Create Original Research That Gets Attention. Fantastic blog post! I can’t agree more with the impact of an original research. Last year, we started publishing the State of Software Development report. Results? Our organic traffic skyrocketed (from 2500/m we went to 5000/m) since we got some press mentions and many blogs covered some parts of the research. Putting together a report like this requires a lot of effort but the impact is much bigger than just rehashing what everyone else has already said. Thank you for your comments. It sounds challenging but worthy! I love you guys and often recommend your blog but you’re missing some key points and nuances here. It’s easy to research badly. It’s hard to ask good survey questions and it is way to easy to misinterpret the data and ascribe significance to the results that actually, statistically does not exist. Also, I think you mean to say “Phone interviews” instead of “Phone surveys.” Interviews are qualitative. Surveys are quantitative. Traditional phone surveys (remember Harris Polls?) were quantitative. The only difference now is that they’re answered online instead of giving the answers to a human on the phone who then entered the responses. In that same vein, “Observation & Analysis” is generally qualitative. The speed of data collection is irrelevant. The quantity of respondents/data points and whether or not you have statistical significance versus anecdotes is key. I cannot tell you how much bad/wrong/misleading research there is out there. Just because accessible surveying tools exist doesn’t mean that everyone is skilled enough to use them! If someone is serious about publishing meaningful, useful research, they should become knowledgeable about how to write solid survey questions and discussion guides and, most importantly how to correctly analyze data. There’s a reason there are classes in statistics and statistical methods! FULL DISCLOSURE: I do this type of content as a service. In your beginning steps, I’d suggest that marketers consider getting outside help. While it’s possible to do a survey without outside help, I doubt most marketers have the programming knowledge to analyze 100,000,000 posts. Ignore my last comment. I hit sumbit too soon. 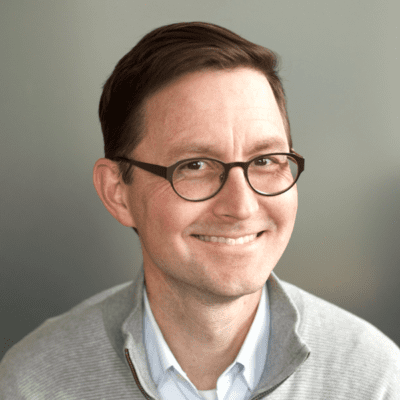 While it’s possible to do a survey without outside help, I doubt most marketers have the programming knowledge to analyze 100,000,000 posts like Steve Rayson. It’s not a bad thing, it’s just that not everyone has every skill needed and that’s okay! 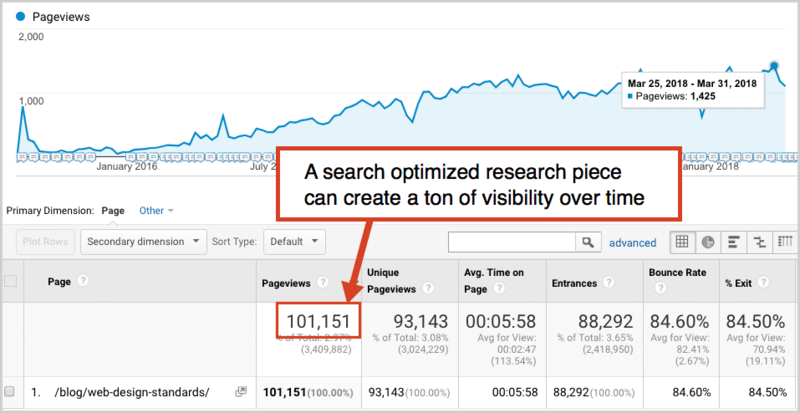 If you’re going to spend 100+ hours on a piece of content, you want to minimize the chances of it flopping. A little extra with someone with experience with this type of content can go a long way. I’d also add that looking at internal company data is a great source for research posts. That way you know that no one else can copy what you’re doing. It’s guaranteed to be truly *original* content. I have been breaking my head with topics for research for quite a while now and seeing your simple examples here…thanks a mil! Awesome article! It provides a lot of inspiration and insights to conduct proper research before writing. To create value, not just post another mediocre content. Thank you once more!